Counsellors play an important role in healthcare. Their work helps to support people struggling with addiction. Addictions have far-reaching effects on society, from harming friends and family of addicts to linking up with crime and poverty. In this way, counsellors not only help addicts directly with their work but they provide benefits to all of society. The work, however, can be emotionally challenging but for those who work as counsellors, it is usually well worth it. Counsellors can work independently or within teams in the private sector. Others are employed by the NHS to work specifically with those who suffer from addictions. These addictions are commonly drug or alcohol ones. Others may include sexual addicts and people who have food addictions such as binge-eating disorders. Much of the decision to work for the NHS or independently will rest on your goals and working style. You should still become accredited although you do not have to attain accreditation to work. It will, however, be helpful to show clients you abide by professional standards. You will also need insurance to cover yourself if you do not work for an employer. Salaries vary in addictions counselling but tend to start around the £20,000 mark and can easily double or more for experienced counsellors and those who are successful and work independently. One of the benefits to working for an employer and within a team is that you will have the opportunity to receive personal evaluations. As an addictions counsellor, your work may show certain patterns of dealing with clients that aren't always healthy. Evaluations and observations from other counsellors can help you ensure your counselling skills remain strong and fresh. While virtually any form of counselling can support a person who is dealing with an addiction, one of the common ones is cognitive-behavioural counselling. In this kind of counselling, a person's unhealthy thought patterns are linked up to behaviours. Preventative measures include changing thoughts to positive ones that can translate to positive behaviours. Other types of counselling such as person-centred counselling focus on providing a safe place for addicts to talk about their problems. The aim is to provide unconditional acceptance, genuineness, honesty and empathy to foster a strong counsellor-client relationship that supports any changes the addict wants to make. Counsellors can face some particularly difficult challenges when counselling addicts. If the addict is still using at the time of counselling, physical and emotional symptoms can be present. An addict may be angry, confused, hallucinating or any number of stressful symptoms. These can make the counselling experience more challenging. Withdrawal symptoms that occur earlier on in the abstinence process can also make a client distressed and emotional. As a counsellor, you will need to help create a safe atmosphere that supports your client's feelings and needs. You also may find you carry your work home with you. Some of the stories you hear will be very emotional, heart-breaking ones. There may be stories of violence and other factors that are dominant in the families of addicts. It can be difficult for you as a counsellor to put your work aside. Some counsellors find that going for counselling themselves can help. Others find coping skills to separate work from the rest of their lives. Often, it takes time and experience for a counsellor to keep work focused and separate from home life. 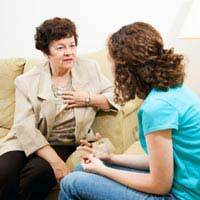 Counselling is an important part of addictions treatment for many people. They rely on a counsellor to help them find ways to overcome their addictions and prevent them from recurring. If you think you have the personal qualities to succeed as an addictions counsellor, then start by applying to an accredited counselling course. Talk to those working in the field and see if you can job shadow to get a better sense of what is involved. Hello, i have a BSc Psychology and MA Psychoanalysis. Does anyone know of how i can progress to become an addictions counsellor please? @Sara - Some universities do an online MSc. Kings College London does and online International Programme in Addiction Studies MSc. This might work for you.